"I stayed in the bush, I was given a machete to use as a weapon. A lot of bad things were happening. One day, a friend died after being shot by a bullet." Ngala, aged ten, Democratic Republic of Congo. No child should have to go through this. Some 250 million children live in countries affected by conflict, with tens of thousands recruited into armed forces and groups. According to the U.N., some are as young as eight. Ngala managed to escape. Now he goes to a child-friendly space run by World Vision where he can play and learn again. He says that being there has helped him to get rid of his bad memories of war. But World Vision can't do this alone. The UK government has committed to end all violence against children by 2030. Yet only 2.5 % of the UK government's humanitarian spending goes on ending violence against children. By contrast, the Government of Sweden invests more than 20 % of its humanitarian aid in this – nearly 10 times as much. So, let's do something to make sure that no other children have to suffer like Ngala. 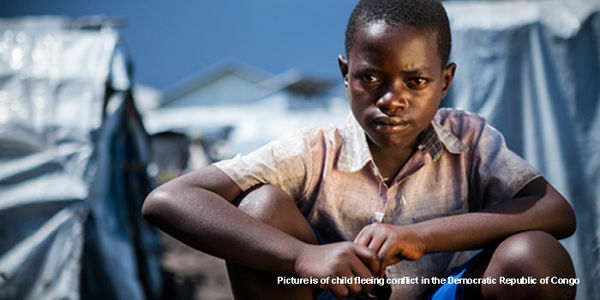 Together, let's call on the Secretary of State for International Development to commit in 2019 to increase UK spending on ending violence against children to at least 10% of our humanitarian aid.